Wax stick used by woodturners on revolving work which generates sufficient heat to melt the wax and allow it to flow on the work. Offers a hard high shine. Principally carnauba wax based. Food safe. Australian made. 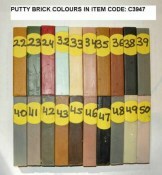 Microcrystalline putty brick used to fill blemishes and dings in cabinetry and numerous other applications. 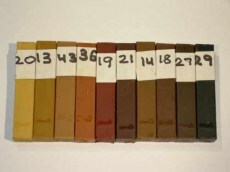 Unlike beeswax based products will accept finishing coatings. 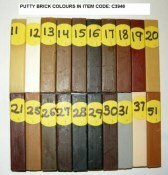 Microcrystalline putty brick used to fill blemishes and dings in cabinetry and numerous other applications. Unlike beesawx based products will accept finishing coatings.